Buying and selling of real estate is big business in any economy in the world. As a population increases, more houses are needed for people to live in and offices for people to work in. Despite this fact of life, real estate transactions can still be very risky propositions! Especially when it comes to probate property if the seller and buyer don’t understand the process. When a person passes away they leave their loved ones and their property behind. 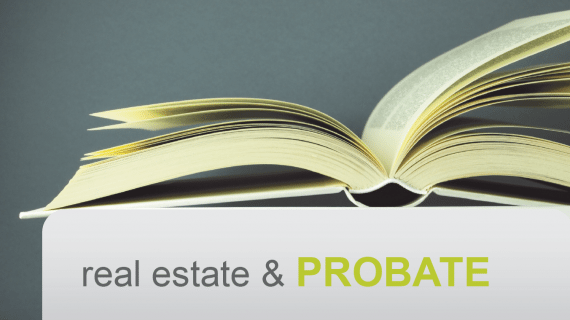 Probate is the process of reassigning the property to the beneficiaries after a person dies. Sometimes the deceased, or decedent, dies with a will and in this case probate is not needed; the will outlines what happens to the property. If the deceased did not have a will then the estate goes through probate and the county court assigns a personal representative/executor to handle the affairs. Can a Bay Area house be sold while in probate? The answer is that it can be sold if simple steps are followed properly. Many times the personal representative (PR) is also a relative (possibly you), and you may not want to maintain this property. Selling could be the easier route. If you decide to sell, we advise you to take the following steps. The probate process begins after a person dies. Soon after, the seller, or PR, is expected to inform the court, which appoints an attorney to take care of the sale. Once this is done, the attorney advertises the property just like other real estate properties. The price is based on the agent’s suggestion and also from an independent appraisal ordered by the probate court. With the help of the independent certified appraiser a property can be appraised. You can very easily look for one on the Appraisal Institute, Yelp or Google. Skye Homes can also help you with a free market evaluation. We’ll use our resources to determine what the approximate market value is…for free. Next, you have to obtain a “petition to sell real estate” from the court. Fill out the petition form and provide all the details related to the sale of the property in along with the method of sale (auction, open market sale, etc.). Then, file the form along with the independent appraisal and wait for the approval from the court. Note: An investor only buys property that has already completed the procedure of obtaining the petition, and we do look into the fact that the seller has gone through the process of obtaining a petition. Next step is putting the property up for sale. Be sure to inform all potential buyers that the property will be sold only after confirmation from the court. As a buyer you have to seek court confirmation to confirm the sale of your property. Generally, hearings take place within a period of 20 to 40 days. You will need to take a 10 percent (of the purchase price) deposit from the buyer before the date of hearing from the court. The public is required to be informed about the sale, so you will have to advertise it in local newspapers. This also allows open bidding for other interested people so that the property gets the best price. If you are seeking to buy property on probate period in the Bay Area, you can bid in the court hearings. We often come to know of good property on probate through the local newspapers. Attend the hearing of the court. This is the place where bids are done and buyers and real estate investors come for bidding. Typically the court will not sell the property below 90% of the list price. After the final agreement is done the cashier’s check is given to court after the bid is confirmed. If there is a new buyer, refund the money of the previous buyer and take the deposit of the buyer after the confirmation has been given by the court… We tend to always pay some money as deposit of the original price to the court after the contract has been confirmed. So after this you can complete the contract with the buyer after the above written steps. Real estate investors look for property that follows all the procedures and abides by the rules of the court. Want to sell your Bay Area house fast (and securely)? We have been in this industry for years and our reputation speaks for itself. If you are interested in choosing us as your partner in the San Jose, Oakland, San Francisco metro area, you are always free to contact us through our website form, our Facebook page, as well as giving us a call at 877-210-6460. We are always here to help walk you through the probate process for a house in the Bay Area! Call us today at 877-210-6460 to get a cash offer on your inherited house today!